Malaria caused by Plasmodium parasites is a life-threatening infectious disease that kills at least half a million people annually while causing over 200 million new infections. In some cases, complications can quickly develop such as cerebral malaria, respiratory distress and severe anemia, often leading to death. The majority of patients recover from disease, however, there is increasing evidence to suggest that survivors experience long-term ‘hidden’ pathologies due to infection that are as yet poorly defined. 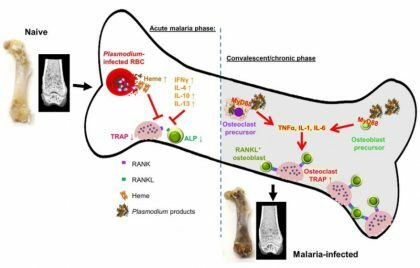 Now, the Laboratory of Malaria Immunology Team at the Immunology Frontier Research Center (IFReC), Osaka University, headed by Professor Cevayir COBAN, have used mouse malaria models to show that robust immune activation and invasion of parasite by-products into the bone marrow during and after malaria infection leads to an adverse balance in bone homeostasis -a process usually tightly controlled- by bone forming osteoblasts and bone resorbing osteoclasts. “Even after a one time malaria infection (it does not matter if the disease is completely cured or chronic low level infection continues), substantial chronic bone loss occurs,” Dr. Coban, corresponding author of the study, says. Michelle Lee, a PhD candidate and the first author of the study explains, “We found that Plasmodium products continuously accumulate in the bone marrow niche which turns the bone noticeably black in color, and results in it being “eaten-up” by bone resorbing cells known as osteoclasts, eventually disrupting bone homeostasis.” These products, including the major malarial by-product hemozoin, malarial proteins and as yet undefined virulence factors, induce MyD88-dependent inflammatory responses in osteoclast and osteoblast precursors, leading to increased RANKL expression (a key molecule inducing osteoclast differentiation), and over-stimulation of osteoclastogenesis favoring bone resorption.” The Coban Team infected mice with a mutant Plasmodium parasite producing less by-products such as hemozoin, and discovered in this case bone loss did not occur, thereby confirming their findings. Importantly, the study shows that there is a simple way to reverse the side effects of malaria infection on bone. Oral supplementation with alfacalcidol, a vitamin D3 analog, could completely prevent bone loss. Therefore, anti-malarials coupled with bone therapy may be beneficial in improving bone health in malaria-infected individuals.